Welcome back from the beautiful 3-day weekend! I hope everyone got a chance to catch some sun or at least rack up a few more hours of sleep at some point. I spent Friday night watching SATC II with my girls, (pics are up now on the HHM page), and then headed down to central AR to visit the fam on Saturday morning for the remainder of the weekend. Can I just say one thing? Oh my. I’m gonna have to hit the treadmill and yoga mat HARD this week to work off the 92 pounds I probably gained over the weekend. But every calorie was worth it because there is nothing like good, southern cooking. It will fix your soul, ladies. Dee, our friend Eunie and I had tickets to the 6:50 showing, but we arrived at 6 because we wanted good seats and we didn’t want to miss the previews. Yeah, we’re SATC nerds like that. WARNING: IF YOU HAVEN’T SEEN THE MOVIE, STOP READING! 1. The clothes. Duh. 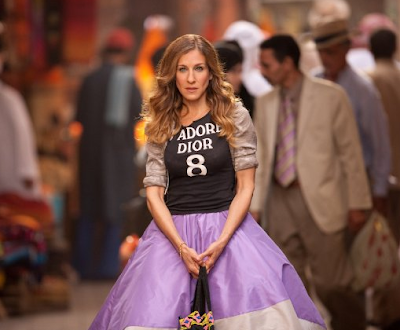 And my fave outfit of the entire movie was the black Christian Dior tee and bouffant purple skirt that Carrie donned when she sees Aidan at the marketplace in Abu Dhabi. Quintessential SATC fashion moment, right there. 3. Liza Minnelli’s performance at Stanford and Anthony’s wedding. In case you were wondering if “Liza with a Z” was still around and kicking…yes ma’am. She put her own signature spin on Beyonce’s All the Single Ladies, and yes, she totally rocked the dance. 1. Carrie’s whining. Was it just me or was Ms. Bradshaw a teensy bit annoying this go-around? I mean, she couldn’t even say thank you for the flat screen TV? At least he remembered the anniversary. Haha! 2. Not enough 80’s flashbacks. Ok, I don’t know about you girls, but I totally got the impression from all the media buzz around this movie that there would be a ton of flashbacks to when the girls first met. I mean, how hilarious was it to see Samantha Jones sporting leopard print leggings and to behold the gorgeousness of Miranda’s 1985 wedge haircut? I wanted more. 3. The magic had kind of fizzled. 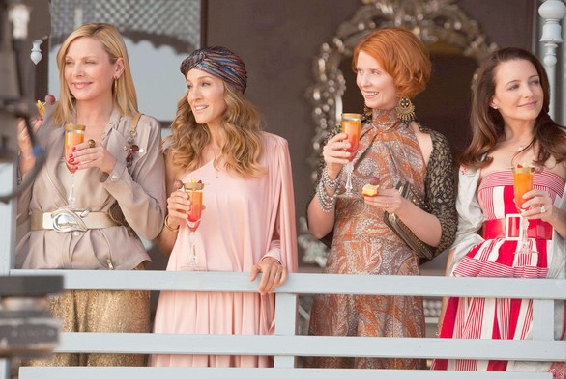 I dunno, maybe it was just me, but I felt like the “sparkle” that made the SATC girls unique was their funny, single-girl banter and strong sisterly bond. It just…wasn’t the same….Did anyone else feel that way? So all in all, it was an ok movie. Not terrible, not life-changing. Oh well, on to the next. Did any of you have a chance to see SATC II yet and, if so, what did you think? Was the magic still there or do you think it’s time to put this series to bed? I thought the movie was lots of fun...but nowhere near as good as the first one. Carrie reminding me of Elizabeth Gilbert who I cant stand! She is the whiniest married woman I have ever seen in my life! Carrie was thinking way too much about her marriage rather than just enjoying life. Ugh. I felt like they were really just trying way to hard. The only one I found realistic was Charlotte - the convo with Miranda at the bar had all the women in my theatre cheering! I think something really drastic would need to happen to one of them to pull a 3rd movie out of the series. I couldn't agree more with everything you said, SP!! I had to SKIP the end because I have not seen it yet...but I cannot wait to see it!!!! I liked the movie! I liked that it was more about them then the guys. In the first movie the boys were such a big part but this time it was all the ladies since they were away. I was a little sad that it was so little New York in the movie! The city was such a big character itself! I have the cutest friend blogger who made a post about how to make Carries turban, check it out! I think what was missing from this movie was NEW YORK CITY. Thats where all the sparkles exists! I really enjoyed this movie, I thought I would hate because it looked so cheesy but it was really a nice happy 2 hours full of pretty clothes, pretty scenery and hilarious lines. Okay I scrolled all the way down and skipped all the SATC II recaps and comments so I could say HELLO! And also - ask you a question about yoga? I signed up for 8 weeks of (I think it's called) power yoga... I desperately need to try something to help me even out this craziness in my brain and I am thinking yoga is going to help. Do you find that it helps you with de-stressing? Do you get into good shape doing yoga? I am really excited to try!! I am little torn about the movie. I LOVED seeing all of my favorite characters together, but still I agree, something was lacking. It might be because they have aged and time had to go on with each character, but it was almost as they tried TOO hard, you know what I mean? But overall I loved the fashion, the sweet scenes between Carrie and Big and I LOVED the Miranda and Charlotte scene as well as the Aiden and Carrie scenes, even though I am a Mr. Big fan. they did do a great job with realistic views of marriage and how to get past the worry stage, lol. I know I've worried about those same issues with BK once or twice before. I definitely think that you wouldn't like the movie unless you were invested in the characters. Because it was more about them living their lives post-singledom than it was SATC. It's always nice to see what everyone is up to (and oogle at the fashion) but I'm not sure they want to pull a 3rd one together any time soon. I totally felt that. The first was definitely better than the second in my opinion. I loved the clothes but I felt that the story had a little less to be desired for Carrie and Charlotte. I loved Mirandas story line though, she was super fun and happy.... A NEW Miranda! Liza WORKED it. Her cameo was one of my favorite parts of the movie! The movie jumped around WAY too much. The Aiden story-line came and went. The whole passport scene was just kinda silly. The wedding at the beginning didnt really have much of a purpose... even though it was prob the best part. I dont know, it just didnt seem to flow like it should. And I was SUPER sad that it hardly had NYC in it at all. I mean, come one thats one of the reasons why we love it! I definitely agree that something was missing from the movie and I think the gal who posted earlier hit it spot on- NYC was missing! We didn't see any of their homes, just snippets of the hubbies and kids. I think we were taken too far out of the familiar to jet set to Abu Dabi. If there is a 3 and I hear there very well could be - I think the whole thing needs to take place in NYC - there are so many directions the stories could take- I would like to see more of Charlotte's day to day mommy-ness, Miranda's work/family life balance, more romps for Samantha and more of Carrie doing what Carrie does best- pondering all aspects of a girl's life(married or single) in NYC. NO more flashy trips! i watched it but never saw the other, and i loved it! it was i guess more fun getting together with the girls.